When Minami lost her husband some years ago, she tried to stay strong for their daughter Sasaki. 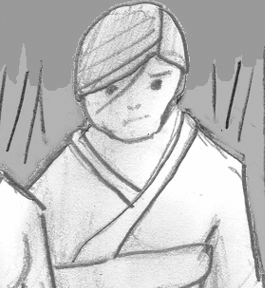 As the young Sasaki withdrew in her grief, Minami felt powerless to ease her daughter's pain. When another family built a house on the other side of the Bamboo Grove, Sasaki was drawn to the youngest of their new neighbors, Ori. Minami believed their new neighbors were a family of fishermen. Minami and Sasaki were shocked when a group of katana-wielding men invaded their home. They said they were waiting to launch an attack on the neighbors. Minami's home and belongings were destroyed by the men. Now they have no choice but to tag along with Ori and the Junichero family, in search of a new place to call home.